Significant advances have been made within the past several years that make it possible for pets to live longer today than ever before. A key component of a wellness plan for pets like cats and dogs is vaccines. For years, pet vaccinations have protected animals against infectious diseases that could prove to be deadly to those pets that are not adequately inoculated. Vaccinations given at the proper times have proven to be highly effective against some of the most dangerous infectious diseases that could afflict pets. Over the years, pet vaccinations have been instrumental in fighting off deadly diseases—sometimes to the point of nearly eradicating them—and saving the lives of millions of pets in the process. 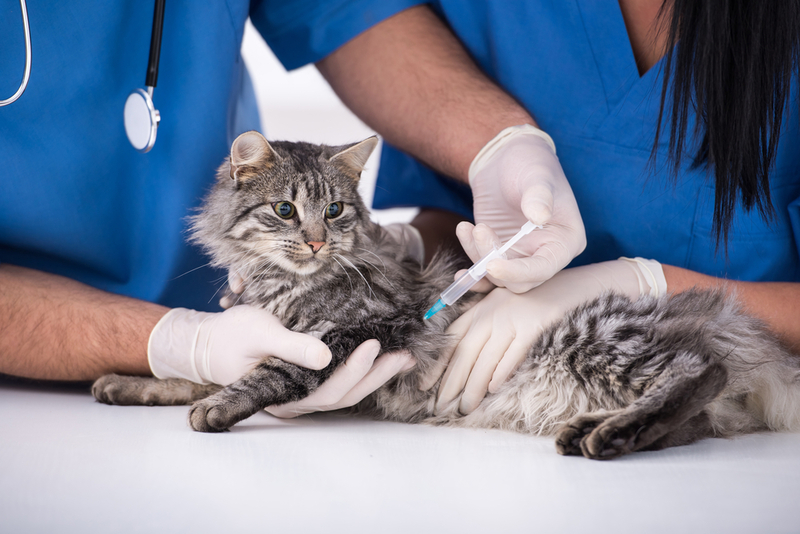 In spite of the strides made over the years, many dogs and cats are still at risk of getting an infectious disease if they are left unvaccinated or are behind in their vaccines. Vaccination programs are extremely successful—in part because vaccines are often considered part of routine pet care today. However, it is easy to become complacent about keeping pets up-to-date on their vaccinations. At SRVC, keeping your pet current on their vaccinations is a job that we take seriously. While every cat and dog needs vaccinations, not every pet must have every available inoculation in order to enjoy a long and healthy life. A pet vaccination clinic that works closely with you and your pet takes numerous factors into consideration when recommending a proposed vaccination schedule. The doctors and staff at SRVC apply a tailored approach to all pet care matters and take your pet’s unique situation into account. Our goal aligns with yours: to keep your pet healthy and happy. Our staff is well-versed in the latest recommendations and advances within the field of pet vaccinations. We work closely with you to develop a vaccination schedule—complete with ongoing boosters—that is designed to safeguard your pet’s health. Our vaccinations schedules are extremely comprehensive in that it addresses those situations that are likely to compromise your pet’s health. However, it is also flexible. Certain factors could influence the decision to tweak a current vaccination schedule. A change in travel habits, an increase in the risk for infectious disease exposure, a reduction in their health and others are all factors that could lead to a revamped vaccination schedule. Changes such as these underscore the importance of taking your pet to a pet vaccination clinic on a regular basis. Only through the expert advice of the professionals at SRVC can you help ensure that your pet is completely protected.